Festivali i Këngës: Kejsi Tola to Moscow 2009! Yesterday evening, the Festival I Këngës was held in Tirana, Albania. 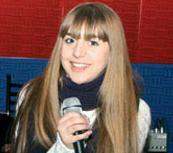 Kejsi Tola won the competetion and she will represent Albania in the Eurovision Song Contest in Moscow. The show was held in the Palace of Congress in Tirana. Twenty songs competed in yesterday’s 47th Festival I Këngës and the winner was chosen by a jury. It seemed the Albanians had had very strong voting as Kejsi Tola won the contest with 126 points and Juliana Pascha, who came second last year’s festival, and Luiz Ejlli, who represented Albania in Eurovision Song Contest 2006, came second with 119 points. The group West Group Side Family came third with 118 points. The song Më mërr në ëndërr was written by Edmond Zhulali and Agim Doçi, the team behind Anjeza Shahini’s 2004 entry The Image of You. Reaching 7th place in Istanbul, it remains the country’s most successful entry to date.